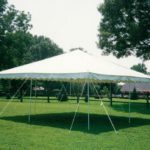 For almost 40 years Toomey's Rent-All Center has been providing Worcester with party tents and canopies of various sizes. 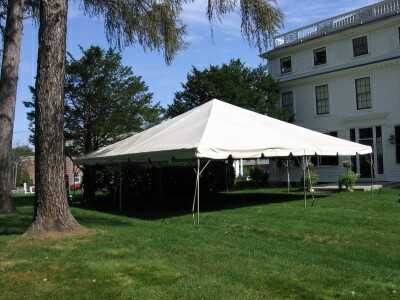 From cookouts to fund-raisers and college graduation parties we've got tents to fit your event. Toomey's currently rents three different styles of tent: "Do it Yourself" All Purpose Canopies, Frame Tents and Rope and Pole Tents. The DIY Canopies are ideal for smaller parties, parties on a budget, or last minute events. These are tents that you can pickup from us (or we can deliver) and which you setup and break down. To start we recommend taking a few minutes to write down any details and expectations you have for your party. How many people are you expecting, how big of an area is available, is it a backyard or somewhere else, etc. We also recommend taking a few pictures of the area you plan to use - this will help Toomey's in getting an idea of what might best fit your needs. Is the area available larger than the tent needed? Is the area relatively flat? 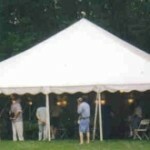 Generally speaking party tents cannot be setup over pools trees or shrubs. If there are some obstructions in place don't get discouraged. Depending on the size of your party, the size of the item, the size of the available area and the number of people you expect we may be able to help you work something out. Visible power, phone and cable lines are something that can be spotted and planned for by anyone. Underground utilities like water and gas lines aren't so easy to find. Massachusetts' state law requires anyone doing any staking to first contact Dig Safe (888-344-7233). Dig Safe is a free service that comes to your home or business and marks any underground obstructions that prevent unauthorized digging. Because most of our tents need to be staked we're required to call Dig Safe before a tent can be installed. This process typically takes about 3 business days so we recommend calling them early. In most cases we recommend calling them at least 10 business days before your event in order to identify and respond to possible conflicts. Due to building permit requirements at both the state and local levels it's also possible that you may need to get a building permit. This procedure can often take a couple days so we suggest booking your tent as early as possible to allow ample time for receiving the appropriate paperwork. If you're tent absolutely must be setup or taken down at a specific time please let us know when placing your reservation. In order to avoid inclement weather we occasionally setup tents and canopies 2- 3 days in advance. Customers are never charged extra when Toomey's decides to setup a tent early. 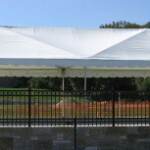 Except when other arrangements have been made, all tents and canopies are setup during our business hours Monday- Friday. We do sell used Tents and Canopies (we can also special order tents if you'd like to buy something new.) For price quotes on purchasing new and used Tents and Canopies please contact us. For large tent, table, chair and china orders please call first to confirm availability and to make an appointment for a meeting to receive a quote. We cannot always accommodate walk-in requests for quotes as our staff is often busy working on existing orders. Please allow up to an hour for all quotes as there is much that must be discussed especially concerning tent setup and breakdown requirements.